Those out there who have followed my blog know I love the beginning of a day, especially sunrise. When I have guests staying at "Old Chilli" I head down the street early to get the days newspaper and if it's market day I get some freshly baked bread. 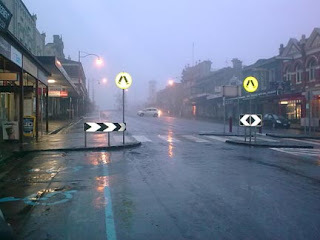 This morning when I headed down the street I was greeted not with a sunrise but lots of fog and drizzly rain. This didn't put a damper on my day at all - I love when it is foggy, almost as much as a beautiful sunrise. I always have loved fog, as a little girl I used to pretend I was in the middle of nowhere. Even as an adult fog gives me the feeling of being able to hide and it may sound strange but it also makes me feel cosy. Wow! This is an amazing photo Davine! It looks like you got up even before the shopkeepers, the birds and you even got up before the sun. ;-) Have a fantastic day! Beautiful photo and fabulous 'story', Davine. Thanks for sharing. Darlene - Yes I was definately up before the shopkeepers and the birds had more sense than me and were keeping out of the rain. Michelle - Thanks I really do love mornings like this.